Vo2 of the brain is 21% of Q=13% or of the entire blood? I am reading now the book which states that the Q (blood flow per unit of time) of the brain is 13% while the Vo2 (relative Oxygen used per unit of time) is 21%. Now my question is if the Vo2 of the brain (21%) is taken from the entire blood or from the part the brain gets (Q=13%)? It is not clear on the book. I've attached the picture with the explanations. TL; DR 21% of the whole body. The VO2 numbers add up to 100%. You are looking at the way six major compartments of the body split the oxygen consumption. The brain takes 21% of the whole oxygen brought into the body by the arteries. The Q numbers add to 100% too. The brain takes 13% of the blood coming out of the heart. The picture is meant to contrast high-flow and high-metabolism organs. The kidneys take 20% of all the aortic blood, but use only 7% of the oxygen consumed in the body. The coronaries take 4% of the blood leaving the ventricles, but use a large 11% of the oxygen take in by the whole body. Not the answer you're looking for? 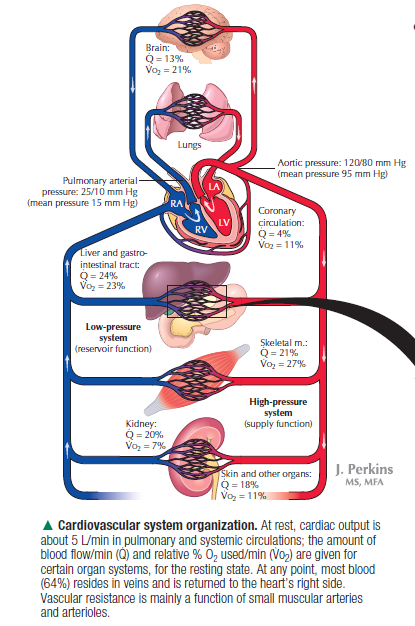 Browse other questions tagged physiology blood-circulation or ask your own question. Regional circulation and Cardiac output? What causes Paresthesia (Pins and Needles) at a cellular level? Is hands-only CPR as effective as traditional CPR? “Blood circulation”. Why blood bleeds in atmosphere ?